A great way to kick off your summer season is to treat yourself with a brand NEW All For Color tennis bag. 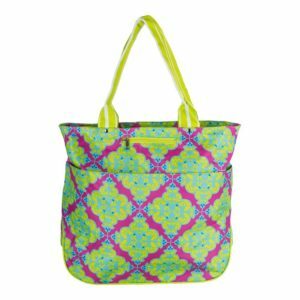 These bags are colorful, fun, and the perfect way to brighten up your day! 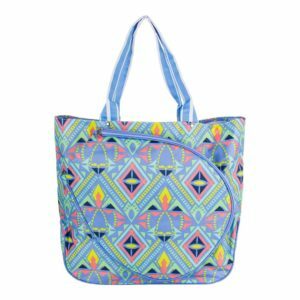 Instead of the normal tennis bag, All For Color has totes, backpacks, and shoulder bags for you to pick from. No worries though, these bags still provide the same amount of function for your on-court missions as the regular tennis bag. I personally LOVE the Tennis Backpack in the Ready Set Glow pattern! It’s small enough to carry around with ease, but big enough to hold all of my tennis essentials –aka, my racquet, gear, shoes, and extra clothing. I never worry about my shoulders hurting or my back aching with the padded and adjustable straps. There are also many compartments, which help me try and keep my things organized. I especially love the size of this bag (click here for dimensions). Carrying around a huge tennis bag was a little difficult, considering I am a mere 5’2’’. This backpack is easy to manage and is a great purchase for us shorties! 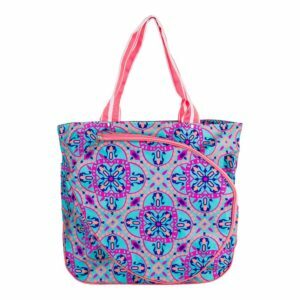 However, if size isn’t an issue for you and you’re looking for a little more room for your things, the Tennis Tote is what you’re looking for. The tote has a spacious interior for all of your essentials, and an exterior zippered pocket that holds up to two racquets. There are also three great patterns for you to choose from that will spice up your tennis outfits. I usually use this bag if I know I’m going to be playing for awhile so I can pack extra gear, food to snack on, and clothing. The Shoulder Bag is great for the days when you have to hurry off the court and go right back to your daily routine. While on the run, you won’t have to worry about transferring all of your things into another bag because it functions as a tennis bag and looks like a purse. It fits everything you will need for the day with the exterior zippered pocket for your racquets and spacious interior for your essentials – without looking too big or bulky. There are also durable carrying straps so your shoulders won’t ache or strain. Boost your bag game in style with any All for Color tennis bag in any of their unique and preppy patterns!